This is the year for Noor to bloom! We are looking forward to a new adventure venture that will be announced soon! 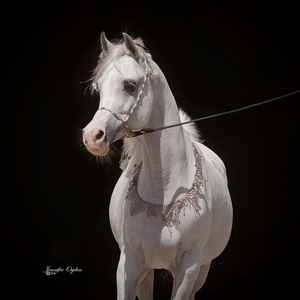 “...Noor EL Nil is three years old now and truly looks like a mature young mare. She is no longer a filly even though her photo shows her as a two year old. (Watch for new photos in August). She is much more bodied out now and mature acting too. Although she and her other three year old pasture mates will sometimes still race around madly for the joy of it. Typically they are more likely these days to go out and find a pile of hay or hang over the fence line gazing at one of the mares with a foal. She is that beautiful alabaster white, so elegant and ethereal and will make a fabulous broodmare and I suspect a show mare too as she matures even more. This year in April as we got ready to take photos I realized that Noor has really grown up a lot, she exhibits more mare qualities even though she is only 2 years old. I love seeing the details a stallion may add and in this case, Noble added some beautiful details. She has a prettier face with more sculptured ears than her dam but all the same snort that Starlight exhibits. A wonderful blending of the two horses. Sometimes there are moments that when breeding horses that you make just the right decisions and are blessed with an exceptional foal. 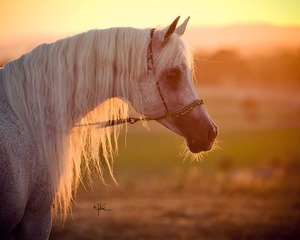 Noor, is one of those foals; she is such a beautiful blending of her dam who is many generations of Ansata breeding with just a few outcrosses such as Prince Fa Moniet, Fa Moniet, Ibn Moniet El Nefous and *Morafic. She is the perfect blending of Ansata, Gleannloch and Bentwood bloodlines on her dam's side of the pedigree. Then we used an equally strongly linebred stallion like Noble, because he has those physical qualities that compliment the mare Starlight. Nobles' sire line is more reflective of the Sameh sire lines that we have found combine amazingly well with our heavliy Nazeer influenced sire lines at SMF. Noor El Nil maintains a strongly infulenced Ansata look with beautiful details from her sire. 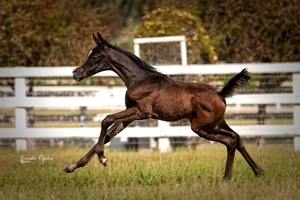 This filly could eaily become a foundation mare for any farm because of her "Quality and Type". Noor El Nil SMF from Christie Metz on Vimeo.